RALEIGH, N.C. — Louisville’s offense was up and down in the season’s first half, showing glimmers of its great promise but also going quiet in big series losses to UConn, Georgia Tech and Clemson. Those three series have accounted for six of Louisville’s eight losses this season — and the Cards scored just 10 runs total in those six defeats. 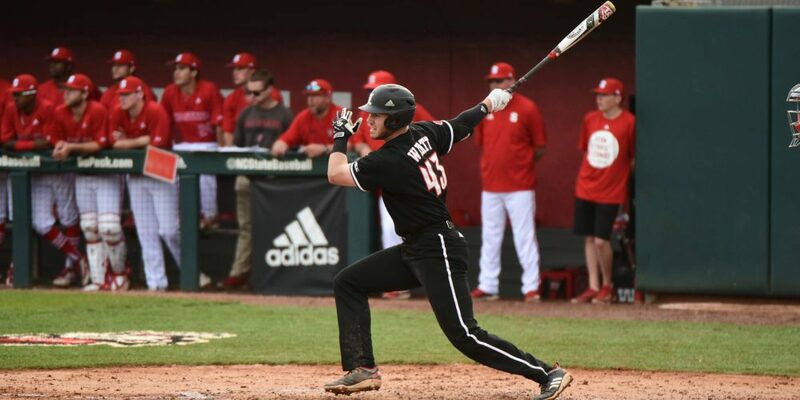 After dropping two of three at Clemson last week, Louisville needed to elevate its offensive level of play in an important road series this weekend at No. 3 NC State, the highest-scoring team in the ACC. The Cards entered this series ranking 11th in the ACC and 181st in the nation in batting (.258), and 10th in the conference (109th nationally) in scoring at 6.2 runs per game. Those aren’t the kind of numbers we expected when we ranked Louisville No. 4 in the preseason Top 25. But what we saw Saturday at Doak Field — that looked like the juggernaut we expected Louisville to be heading into the year. The Cardinals pounded out 18 hits in a 14-10 win in the first game of a series-opening doubleheader, then banged out 18 more hits in a 14-2 blowout in the nightcap, clinching a much-needed marquee series win.